Happy Friday Loves. I just had to share with you three of my favorite new wines and a fabulous pimento cheese to go with. It’s the weekend (finally!) so it is time to indulge! I highly suggest you check these babies out. This wine is amazing! So smooth and creamy. Retails for about $14. I was pleasantly surprised when I tried this wine, I bought it at a wine sidewalk sale and the vendor really talked me into trying it. It is awesome! A perfect Cab. It retails for about $21 but right now for some reason at the grocery stores (at least here in Charleston) it is on sale for $10.99. I have been having a love affair with Malbec’s lately. This one is very tasty for only $8.99. Who doesn’t love pimento cheese, well at least what Southerner doesn’t love it? 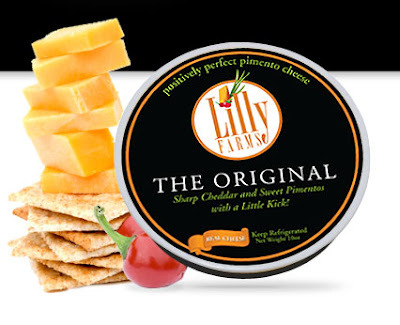 This cheese is made nearby in Chester, SC and it is divine. I hate when pimento cheese is too mayonnaisey, it makes the cheese super greasy. This is not. It is the perfect blend of cheese with light sauce. 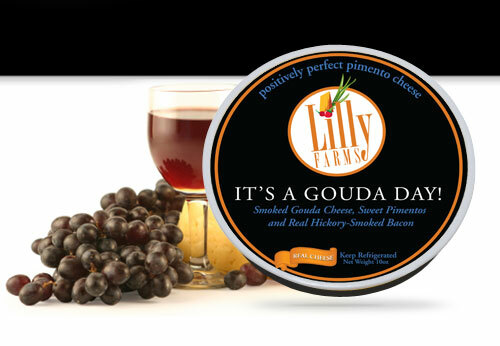 I have been enjoying the “It’s a Gouda Day” filled with Gouda, sweet pimentos and hickory smoked bacon. Trust me this pairs perfectly with the wines I mentioned! They also offer two other flavors “The Original” and “South by Southwest.” Most of the Piggly Wigglys here are Charleston are carrying this spread so try it asap! BTW Check back tomorrow I have a recipe to share! Thanks for the heads up about the pimiento cheese! I love Palmetto Cheese (from Georgetown),but I will look forward to trying the gouda variety, too. Have a great weekend! Gouda is the best!! I love a little smoked gouda sliced on apples — with a glass of wine of course! Cheers!! The combo for a great weekend, wine and cheese!!! Must try the Malbec, and will be heading to the Pig asap for the pimiento cheese!! Thanks for sharing!! More wines to try! *smile* Just stopping by to say Happy Friday and Stay Blessed.. WHAT?! I'm a cheese/pimento cheese FREAK. Why have I not had this gouda version? Must go get this weekend. Thanks for sharing. Yay! You had me at pimento cheese – oh its sooo good! Do you have try any organic wine or ones with less sulfites – when we honeymooned in Europe I felt like the wine was sooo much better. They kept telling me that it was that European wine has less sulfites, which equals less hangover (yay). Anyway, just wondering, you seem like a fab wine connoisseur! When I was in college one of the restaurants I served at had the Alamos Malbec. It was always a favorite! We're always looking for new, inexpensive wines to try. Thanks for the suggestions, just in time for Valentine's Day! Girl after my own heart!!! have a wonderful weekend. We LOVE Malbecs, too! And I want to try that St. Francis Chardonnay. I've heard wonderful things about it! Have a great weekend! I love PC so I must try this brand. Thanks for the tip! wine and cheese = awesomeness. especially pimento cheese and malbec or cab…both of which i now want to try. i've been loving "educated guess" cab lately. I have never heard of pimento cheese, it sounds like I might be missing out on something good in life?! Do they serve it in restaurants? Might I try it when I visit Charleston in June? I don't think there is a cheese I've met that I didn't like, in fact we just joined an olive oil and cheese club for every other month deliveries! Heading to the wine store this night and I'm going to keep me eye out for Dynamite. I love a good cab and pimento cheese combo! Yum, yum, and yum! Hope you have a fantastic valentine's!!! Thanks for the tips! I am always looking for new wines (especially Malbecs) to try! 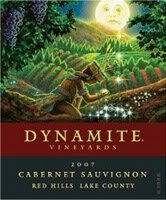 Check out Costco for the Dynamite wine. I believe its around $12.00 a bottle. Enjoy!